Create a backup of your Ghost installation. Congratulations! Your Ghost installation has been updated! In your existing (pre v1.0.0) Ghost blog, navigate to the “Settings -> Labs” section and click on the “Export” button. This will download in your system your JSON export file that you need later. Launch a new Bitnami Ghost instance. 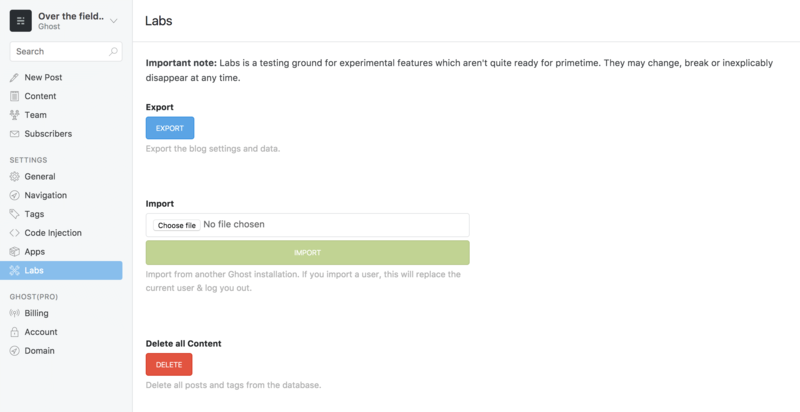 Import your content into your new Ghost instance. In the new blog navigate to the “Settings -> Labs” section. Click “Choose file” and select the JSON export file created before from your system, then click “Import”. NOTE: Please note that Ghost importer will not import themes. You could see a warning that your themes have not been imported, that is the normal behaviour, you can continue to the next step. Copy your images from your existing directory /opt/bitnami/apps/ghost/htdocs/content/images to the new instance directory /opt/bitnami/apps/ghost/htdocs/current/content/images. Move or upload your themes. To do so, navigate to the “Settings -> Design” section and click the “Upload a Theme” button. Follow the instructions. Now you have your system fully migrated to the newest Ghost version!